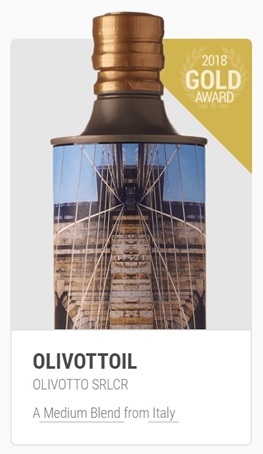 On April 27th 2018, Olivottoil was rewarded with the GOLD AWARD at the New York International Olive Oil Competition (NYIOOC). The Olivottoil Manhattan is a blend of Coratina, Cima Di Melfi and Biancolilla olives that have been manually harvested in Salento during Nov-2017. It is an intense green, fruity oil with a light bitterness, medium pungency and a chicory aftertaste. After years spent in search of best olives and best practices we have eventually achieved our dream of getting the top award for two years in a row in the olive oil world. We are committed to improve and stay in the NYIOOC race for ever. This year edition was attended by 1000 samples from 27 different countries, throught a real international jury. SMELL: Medium fruity olive ripeness with delicate hints herbal / floral. TASTE: fruity, clean just-ripe olives and herbs with floral amplitudes. Recall, in closing, to fresh artichoke and chicory sweet. Intensity gradually Medium. First impact of mild sweetness with the bitter takeover / spicy aromatic carefully measured under overall. Very slight residual astringency. Excellent persistence and complexity. On April 27th 2017, Olivottoil was rewarded with the Gold Award at the New York International Olive Oil Competition (NYIOOC). The Olivottoil Manhattan is a blend of Coratina and Cima Di Melfi olives that have been manually harvested in Salento during Nov-2016. It is a robust green, fruity oil with a light bitterness, medium pungency and a chicory aftertaste. After years spent in search of best olives and best practices we have eventually achieved our dream of getting the top award of the olive oil world. We are committed to improve and stay in the NYIOOC race for ever. This year edition was attended by 910 producers from 27 different countries. The NYIOOC judges are assembled among the best in the world from all the leading olive oil producing countries : Italy, Spain, Greece, Tunisia, US, Japan, France, Turkey, Australia.